Are you ready to get started improving work flow but just don’t know how? Do you want to build a process based culture? Do you want to buy a BPM suite? These are a few of the questions that organizations ask at one time in their development. But when to address these questions and how to address them depends on your purpose and company culture. And they can’t all be addressed at once. Part 1 is covered here; part 2 will be covered in the next article to be published in a future issue from BPM Institute. Before beginning on a change effort such as becoming a process-based culture you need to understand the organization’s readiness for change and the reason for doing something now. What is the work culture like today? How does it operate? What do you measure and reward? What are the behavioral norms? What is the business need behind the initiative? Can you articulate a burning platform? And do you have a champion to promote it and support it? These are critical questions. Depending on the scope of the change effort, they can be addressed at the department, division or enterprise level. Jerry Talley of JL Talley and Associates has enumerated 5 different management levels of work, as depicted and described in the graphic below. These will help you assess where your culture is today. You can see that ‘Process’ does not enter the picture until level three. Before that there is Traditional and Involvement. Each stage builds on the former and you cannot jump from one stage to two stages above it; the organization needs to move through each stage. It takes a combination of factors to move from one level to the next level, including leader/manager behaviors, skills, and the reason to work on this problem or process now. Moving from Traditional to Involvement takes impetus on the part of the manager and trust on the part of the employees. Managers need a reason to listen to employees and employees need to feel safe from retribution if they point out problems. The business need which encourages this transition, is often at a personal level, such as a great idea coming from an employee that a leader implements! And it’s helpful if the leader gives credit to the employee for his/her idea. To move from Involvement to Process, leaders must recognize the value of looking at work as a process vs. fixing the situation by just providing training to staff or hiring new staff. Managers need to model the new behaviors by helping their staff learn process skills, as managers and employees shift their focus from blaming to looking at what’s working and not working in the process. Often, a failed product launch or other major stumbling can catalyze this transition from involvement to process. In “Involvement”, management may bring employee groups together for conversation and problem solving. But to move to process, the method needs to go beyond group conversation to mapping the steps and decisions in the process, gathering quantitative data, and analyzing what’s working and not in the current process. In one client situation I had, when managers continuously dealt with problems by asking for more headcount saying employees were burning out; the company finally realized they needed to shift to a more standardized “process” approach and stop relying on the personal efforts of individual employees. But as the organization moves to the first Process stage, it faces a raft of changes, and that’s why process may sound stupid initially. Boundaries change. When you think of work as a process, activities no longer are contained within your functional area; instead they move across departments. This means that employees doing a job have to think laterally, providing products, information and services to other departments as part of the process. The boss is no longer your primary customer. Each process has a customer, either an internal customer or and external customer, and the customer (not your boss) determines if the product meets specifications. The process determines the steps, decisions and flow to get the output to the customer. Customer expectations and customer feedback provide input as to how the process is working, which may suggest specific feedback about each role’s contribution to that process. Power changes. In hierarchal cultures the boss has the power. Power resides at the top of the hierarchal function and flows down hill from there. You know who your boss is, her boss, and the big boss. You know where to go for direction, for work priorities, for performance goals and management, and for reward and recognition. But in a process culture, employees perform work in several processes, which often means in different functions. Leadership moves from telling and having solutions to coaching. Power comes from providing high performing processes to the customer, which in turn provides revenue or recognition for the company. I find many organizations think they are at Cross Functional because they have one or two projects that span several different functions. Examples of these might be ERP implementations or company wide supplier guidelines with a new procurement application. Both of these examples need cross-functional cooperation, but implementation may have been a result of senior management edict rather than having a cross-functional process in place. In one company I found that long term relationships and experience made it possible to manage multiple hand offs, but the organization did not have documented cross-functional processes where employees knew the steps, decisions and their role. Instead, to begin to transition to the cross-functional work level stage, managers need to define their jobs differently. They must focus on producing the output for the customer across department boundaries, which means enabling their staff to contribute to the process across boundaries, enlarging job responsibilities of employees, and building relationships and influence across functional boundaries themselves. The final stage pictured in Jerry Talley’s model is Matrix. 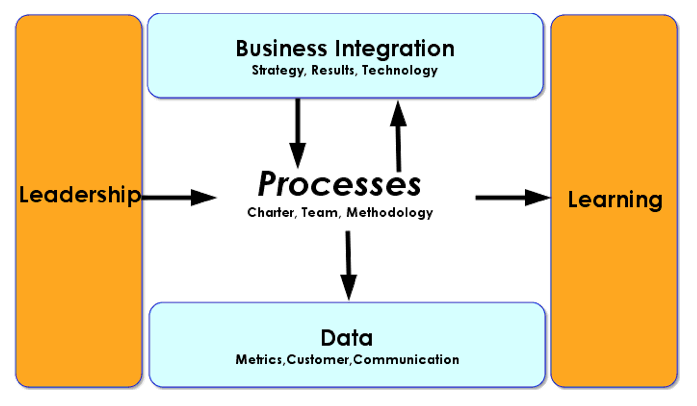 Process owners are identified for core enterprise end-to-end processes. At this stage process improvement is a tool of governance and part of the strategic planning and execution. Movement to this stage occurs because the organization shifts its hierarchy from vertical silos to cross-functional core processes. Process owners often report to the CEO and have budget authority and/or revenue responsibility. Employees work under two bosses, their functional manager and the process owner. Of course, this creates tension and may threaten department heads. I see process owners named in many organizations and their roles and responsibilities clearly defined. But they act more like sponsors or project leads for specific project process improvement efforts. This is a start, but process owners need to go beyond a specific improvement effort and continue to monitor and improve the process once initial improvements have been made. It is this ongoing effort and company-wide influence that begins to point to a ‘real process owner’ vs. a start-up project process owner. The graph below depicts five critical contributors to any process effort. Many of these components have been covered in the five management work levels, but I will elaborate in a few areas. In level three, “Process”, department processes are mapped, analyzed and improved. Department managers lead these efforts, expecting to see improvements within their own departments. Employees learn process improvement skills, identify initial process measures and develop an understanding of customer needs and requirements. 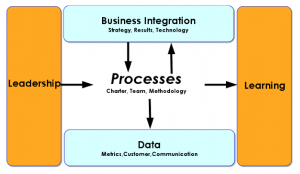 In the cross functional stage, larger processes flow across several departments. Employees learn to work toward the output desired of the process and by the customer, and see how their activities and decisions impact later steps in the process and how inputs impact their work. Larger corporate challenges drive the selection of these cross functional efforts and executives may be asked to work beyond their hierarchal boundaries on cross functional initiatives. In the matrix stage new leaders, called “process owners” manage end-to-end process work across the corporation not just through influence but also with budget and revenue accountability. When the organization sees key priorities in the marketplace it creates or improves processes in place to meet those challenges. The organization as a whole is learning; in fact, the ecosystem is learning, including supplier and partnership relationship. But the next question is what approach to keep increasing process maturity is best for my organization, and how do I know that I am moving to the next level? In the second article in this series I will look at three different process maturity models and show how three different approaches – top/down, middle/out and bottom/up can work to move an organization up the maturity scale.